No one has swagger like our Badass Knife of the Week. All right, all right, despite the admittedly silly name, the Gerber Swagger is a slim and stylish everyday carry option that’s inexpensive but gets the job done. The 3.25-inch blade has the best of both worlds with a combo edge — half straight and half serrated to tackle all types of tasks. The black-coated stainless steel is nothing to write home about but it’s easy to sharpen and resists corrosion like it’s no one’s business. Dual thumb studs make opening the blade with either hand effortless. One side of the handle features textured G-10 scales that help keep a grip in any environment. A stainless steel frame lock on the rear side of the handle prevents the blade from disengaging. A few grooves in the stainless steel frame also add to the overall grippiness of the knife. You can carry it in your pocket with a single position, tip-down clip. It also comes in an assisted opening version and mini version. 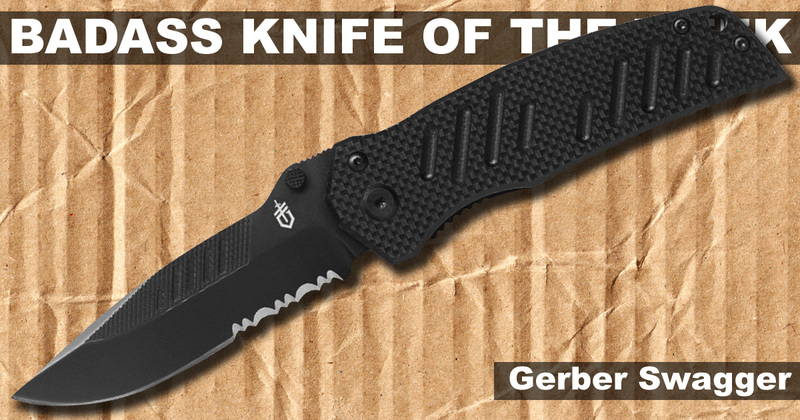 For more info on this Badass Knife of the Week, see the product page for the Gerber Swagger.